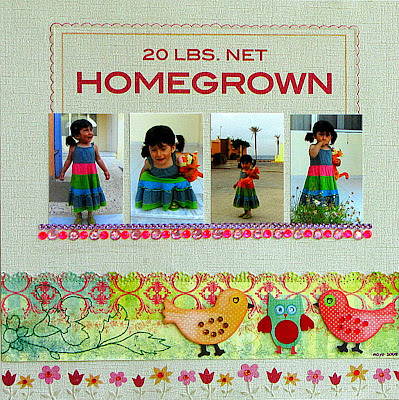 I am in the middle of a computer switch and lots of connection problems on top, so I am posting this project today, though it was revealed yesterday at Practical Scrappers' Core cardstock feature. I have had this piece of cardstock for some time, saving it for a special project, and it was time to use it! It was a very easy layout to put together, using the design already printed on the cardstock and adding some details to it. I used a strip of specialty paper and embellished it with die cuts and rhinestones. I also used rhinestones on the flowers that were printed at the bottom of the page and a yummy strip of rhinestones below the photos. Love how the different stripes in the layout mimic the stripes in my daughter's dress.